Let's say you bought a guitar cabinet speaker for a favorite guitar amp. Let's say it sounded so good, you decided to buy a second one. However, let's say that your guitar amp has a single output speaker jack. Hmm, what to do? How to play two cabinets with one jack? This article demonstrates how to easily and cheaply modify a guitar cabinet so that two or more cabinets can be run in parallel or serial. This article is primarily for amplifier enthusiasts, electronic hobbyists, and do-it-yourselfers who like making things. You should have basic soldering and electric tool skills. On the right is Orange Amplifiers PPC108 Micro Dark 1 x 8" guitar speaker cabinet. It has a 1 x 8" "Voice of the World" speaker driver and sounds pretty good for its $100 retail price. However, what caught my eye is how sturdily it was built with tolex covering, metal corner caps, lay-flat handle, and cane grille. So, after pulling off the cheap, hot-glued plastic logo, I am now ready for modding. Don't believe the hype. Some say this is a Baltic Birch plywood cabinet. In reality only the back panel is 7 layer plywood. The rest of the panels are composite pressed board. This is the speaker cabinet with the rear panel and the stock speaker removed. Pressed board is dense, but it is susceptible to water. So if the cabinet is played in the rain. or gets soaked in a flood, the boards are probably going to fall apart. Pressed board does not take screws well and repeated disassembly will probably tear apart the screw holes. Using glue will repair the holes, but it will make the next disassembly a problem. My first modification was to replace the speaker driver. 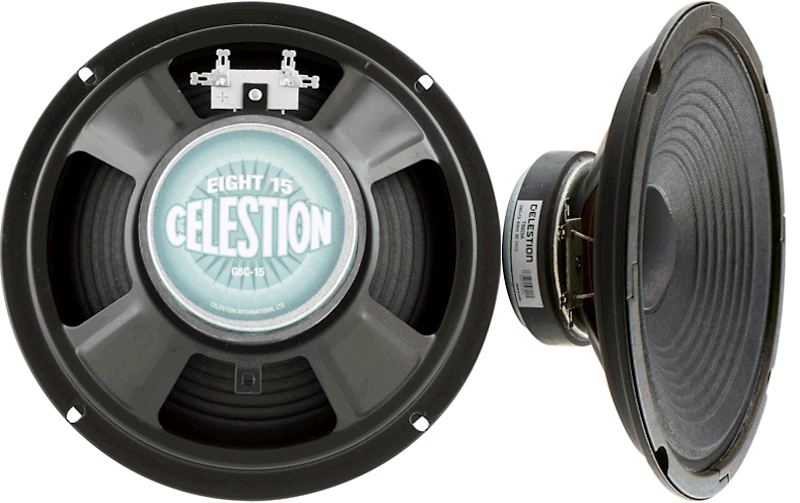 I chose a Celestion Eight 15 8" driver which has a vintage British tone. Britsh tone means the speaker tone is relatively flat with no accentuated frequencies, perhaps a little more weighted to mids and highs. It also means the voice coil is pretty ample and has enough oompf to make the cone break apart at high volumes without melting the voice coil. For an 8" speaker, this has fairly decent low end. I think this is a awesome speaker for the $29 retail price. Speaker sizes seem to be miniaturizing lately. In the old days, most home speakers had at least one 8" woofer. If you had more money, you bought one with a 10 or 12" woofer or more drivers. This was considered ample low bass for most home listening. Then came the home theater era of the 1990s, and many people bought speaker cabinets with 6" and 4" woofers. Few seemed to care about bass. Those who did bought a single-driver 12" sub-woofer. Nowadays people buy Bluetooth-enabled speakers, and they think they have great bass on their 4" speaker. Perhaps compared to the phone 1/4" piezo-driver they are correct. If you are a guitarist like me, a 12" driver is great, and bigger or more is preferable. It sounds strange to consider an 8" cabinet as a lightweight portable cabinet when it dwarves most people's home sound system these days. If you like one 8" cab, two must definitely be better, right? In fact they are. They have more driver area than a single 12" driver. They also are a bit more versatile, as they can be carried more easily. They can be pointed in different directions for better sound dispersion. Now is time to look at the schematics to hook this up. 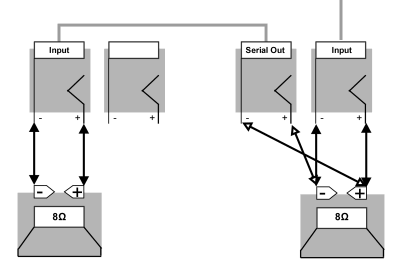 Ideally, your guitar amp has two output speaker jacks, and then you can play them both as shown in the schematic diagram. One output goes to the left speaker cabinet input jack and drives the left speaker. The other output goes to the right speaker cabinet input jack and drives the right speaker. 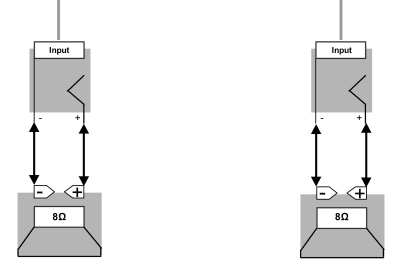 In the diagram two eight ohm (8Ω) speakers are shown. Eight ohms is the impedance of the driver, and this is a very common load value for guitar amps. One terminal of the driver is connected to the center (positive) connecter of the input jack. The other terminal of the driver is connected to the ring (negative) connector of the input jack. However, many smaller guitar amplifiers usually have a single output jack. The rest of the article shows you how to hook up one speaker output to two speakers inputs with an extra jack ($5), some wire, and a soldering iron. 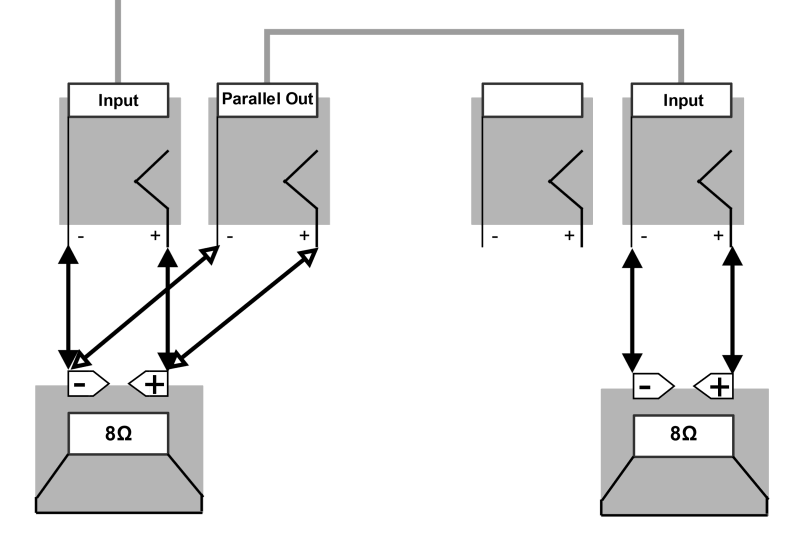 This schematic shows how to connect two speaker cabinets in parallel. The cabinet on the left adds an output jack. The left speaker driver is wired positive to positive, negative to negative to the output jack. A second speaker cable connects the left speaker output jack to the right speaker input jack. Notice how the left speaker positive goes to positives on both jacks and the positive on the right speaker. 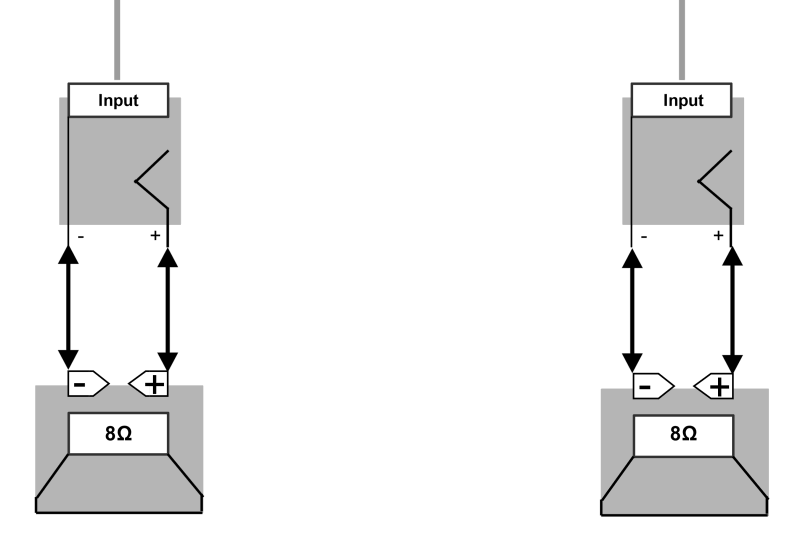 An issue known as Ohm's Law comes into play with two speakers wired in parallel. The impedance of two 8 ohm speakers in parallel is halved to 4 ohms. This may cause an issue with your guitar amp output. You must use this 4 ohm parallel combo with an amp output of 4 ohms. If you don't, you risk burning out your amp transformers and circuits. Or you may start with two 16 ohm speakers to create an 8 ohm parallel combo. Many smaller amps are more likely to have three 4, 8, 16 ohm outputs than a second 8 ohm output. So hopefully this cabinet modification gives you an option. Another way to deal with Ohm's Law is to wire your two speakers serially. The schematic shows the right speaker with an added output jack This time the right speaker positive terminal is wired to the output jack negative, and the right speaker negative terminal is wired to the output jack positive. Notice how the right speaker positive will connect to the left speaker negative, putting the drivers together in an additive (serial) configuation. Ohm's Law also states that the impedance of two 8 ohm speakers in serial is doubled to 16 ohms. You must use a 16 ohm serial combo with an amp output of 16 ohms. Or you may start with two 4 ohm speakers to create an 8 ohm serial combo. In my case, I started with two 4 ohm speakers, so I used this option to hook up to a single guitar amp 8 ohm output. 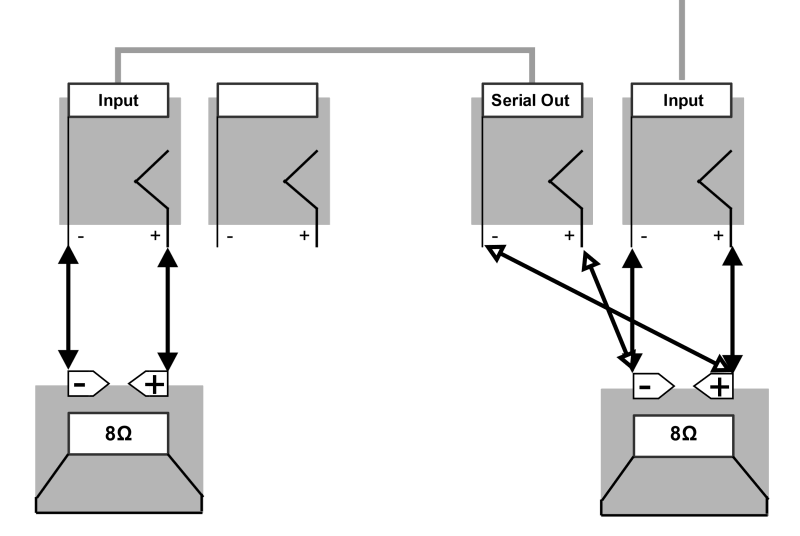 If you understand the schematics, you are ready to go forth and mod your cabinets. The rest of this article shows details on how I modded my two cabinets. The photo shows the single speaker input jack for the Orange Micro Dark cabinet. The original speaker was a very common 8 ohm driver. To use the same 8 ohm amplifier output, two speakers must either be two 16 ohm speakers in parallel, or two 4 ohm speakers in serial configuration. Unscrew the jack plate and you see the speaker driver connections to the cabinet input jack. Orange could have saved money if they used a typical mono jack connector. The Orange connector is a stereo jack which has left, right, and ground connections. Notice the jack in the picture has six legs, 3 for internal ground/left/right and 3 for external ground/left/right. Also notice, the middle connector is unconnected. The good designers at RCA made the stereo jack backwards-compatible, so you could use the newer stereo connector. The stereo jack costs a little more because it has more pins and connections. This connector also has another feature that plays into this story. Here I have used my drilling skills to add a second jack next to the original jack. I used an inexpensive mono jack which has a single ring (ground) and a center (positive) connection. I soldered a black wire to connecter ground and a red wire to the connector positive. Warning! This photo shows the wrong way to connect the second jack! Can you see the problem with this wiring? Here is a clue to the issue. Notice that there are three tiny metal tabs shown on edge in the center of the photo. These tabs are touching the the 3 legs closest to you, forming a nice connection. This photo shows the connection when speaker jack cable is inserted. Notice the jack lifts the three tiny metal tabs in the center of the photo. The tabs are no longer touching the 3 legs closest to you. The new output jack is no longer connected to the input jack or the speaker terminal connectors! The problem with this wiring stems from the fact that the original input jack is not a typical mono speaker jack, but rather a stereo guitar input jack. Orange somehow must have scored a deal on these jacks because they are not often used for speaker jacks. They are most often used for guitar inputs. For guitar input jacks, the idea is that when the input cable is removed, the guitar inputs are connected to ground, removing it from from the amplifier circuit. This makes the amp input more immune to noise and makes the guitar amp quieter. This photo shows the correct hook up. Notice that both the speaker terminal wires and the new output connector wires are connected at the same point, always making good contact. Again the reason why the red jack wire connects to black speaker wire is to flip the polarity of the connection, thus putting two speakers into a serial configuration. If you are building a parallel configuration, you would wire red to red and black to black. Don't forget to update the labels on your speaker cabinet jack plate. Here I put the 4 ohm value of the speaker and the serial configuration on the white label to the left. The original input connector is in the center. The new output connector is on the right. I have also scratched out the original 8 ohm label of the jack plate. Here is one way to validate your speaker wiring. Whether you have a parallel or serial configuration, given the same input, two eight inch drivers should be twice as loud as a single eight inch driver. If this is not the case, you probably have wired the combo incorrectly. On my system, I noticed that a single 4 ohm speaker in the amp 4 ohm output was louder than two serial 4 ohm speakers in the amp 8 ohm output. I had one speaker driver connected in reverse to the jack plate, and so the two speakers were canceling each other's sound output. I reversed one speaker wiring, and sure enough, two speakers are twice as loud as a single speaker. And now I show you my two by eight mini stack. The two 8" cabinets are stacked and packed! On the extreme left is a single 15" driver speaker cabinet. You can see that the two eights stacked are about one inch taller than the fifteen. On top sits a lightweight Quilter 101 mini amp head. In combination this makes a very light and powerful traveling guitar combo. Thanks for visiting the site and reading the article. I hope you enjoyed the detailed photos and commentary. Feel free to email me with any comments or questions. More articles are found at the parent Guitars and Music page. Last modified: Sunday, 26-Mar-2017 15:14:52 MST.